Google has released Chrome browser update 73 which has changed the Screen Sharing prompt that students receive when a teacher starts a Vision for Chromebooks classroom. If you double click the image, screen sharing takes effect. If you select the screen you want to share the word 'Share' is highlighted in blue. This is due to the possibility of having a second screen. 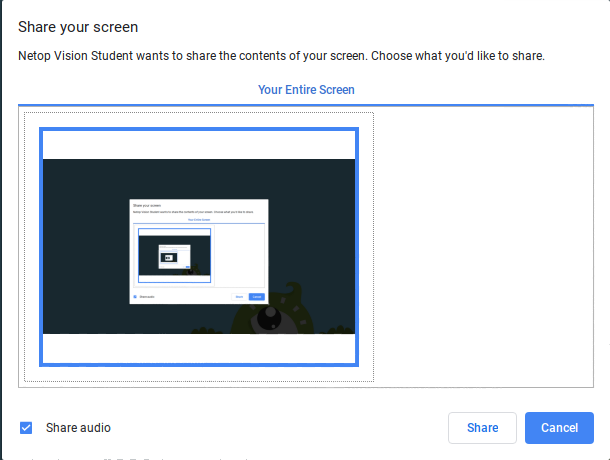 When you click 'Share' this will share the screen with the teacher. These are changes implemented by Google. Netop does not have the ability to change these options through the Vision for Chromebooks software. Posted - Tue, Apr 2, 2019 4:35 PM.